This awesome guest post was written by Aamar Khwaja, Inventor of modgarden (Mod Garden). Aamar is a health advocate and on a mission to see everyone eat healthily! With the start of summer just a few weeks away, you’re probably looking forward to heading to your local farmer’s market or grocery store to buy some fresh fruits and vegetables to make some delicious home-cooked meals. Making quality, flavorful dishes would be incomplete without accompanying herbs and spice to truly elevate the flavors. Although herbs are readily available at farmer’s markets and in the produce section of your grocery store, it is super simple—and even healthier! —to grow your own herbs at home. In addition to the dietary benefits, herbs can also be used for their medicinal properties. Growing an in-home herb garden this summer is a great project that will not only help you with cooking but also with your overall health! Here are the top 5 easiest and healthiest herbs to grow in the comfort of your own home. Even if you don’t have a green thumb, growing these herbs is simple, fun, and so healthy. Basil is one of the most popular kitchen herbs. Originally native to India, this herb is known for its sweet, minty, and peppery flavor. Perfect for cooking, its fragrant leaves can be used as a seasoning or can constituent the key part of a recipe such as a pesto sauce. In addition to its delicious flavor, the medicinal properties found in this herb are extremely beneficial. Basil is a rich source of vitamin K, beta-carotene, and iron. It is also known to have anti-bacterial, anti-inflammatory, and antioxidant properties. Growing basil is quite simple, especially during the spring and summer months as it tends to grow best in warmer weather. To ensure your basil plant remains in good condition, pinch off any flowers that appear. It’s generally best to harvest the uppermost leaves first. Add raw to salads, sandwiches, or soups, use as a garnish, make pesto, or brew a basil leaf tea for help with colds or soothing an upset stomach. Thyme is a very useful herb that can be used in a variety of ways. A member of the mint family, thyme has a delicate aroma that will make your home or apartment smell delicious. Like basil, it is relatively easy to grow indoors especially in the spring and summer months. The history of thyme is pretty interesting—it is one of the world’s oldest aromatherapy and medicinal plants and originated in the Mediterranean. Today, there are several different varieties of thyme, including lemon thyme, coconut thyme, caraway thyme, and many others. The essential oil found in thyme plants is known for having anti-septic, anti-viral, anti-parasitic, and anti-fungal properties. In addition to all of these impressive benefits, thyme is also good for detoxification. For respiratory and digestive distress, thyme may help as it can have a relaxing effect. With benefits such as these, thyme is a fantastic herb to grow in the comfort of your home with a truly staggering amount of benefits. Thyme can be added to pasta sauces, breakfast dishes, or to fish or meat when cooking. The herb grows best with at least a few hours of sunlight each day, so place the pot near a south or southwestern facing window to create optimal conditions. You can also store thyme by drying it or freezing it. What’s not to love about mint? A fantastic herb, this plant is used everywhere—from ice cream to alcoholic beverages. If you’re just beginning your home herb garden, mint is the perfect plant to begin with, especially with the upcoming summer months. 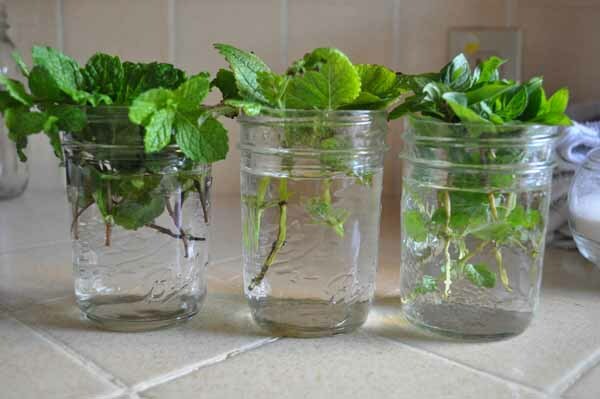 Try adding a sprig of mint to iced beverages, such as a glass of water or iced tea to stay refreshed this summer. Another benefit of growing mint in the summer months is its helpful cooling benefits. Mint contains menthol which can cool the skin, making mint a handy herb to have around for sunburns. You can also make a homemade peppermint tea which is a delicious and excellent way to ease an upset stomach as mint can soothes the digestive tract and helps to alleviate indigestion, gas, and cramping. For anyone suffering from allergies or sinus problems with the blossoming of flowers and foliage, mint can be extremely beneficial in clearing sinus congestion and fighting off infections. Chives are members of the onion family and are most commonly grown for their leaves and flowers. There are many types of chives, including onion and garlic chives. They grow well in small containers, making them a perfect plant to grow in your apartment or home. Chives have a mild peppery flavor that works well in many different dishes. The purple flowers of onion chives are also edible and can be used as a garnish or even in a summer soup. Chives have a flavor profile as well as medicinal properties similar to garlic, although they are much more delicate and palatable. Medicinal benefits of chives include aid with digestive issues, antibacterial qualities, and support for overall heart health. Additionally, like garlic, chives help boost the immune system due to their high levels of vitamin C.
Increasingly popular and accessible at health food stores, wheatgrass is one of the most intense superfoods around. Just a few ounces of wheatgrass juice boosts the nutritional equivalent of several pounds of raw vegetables. 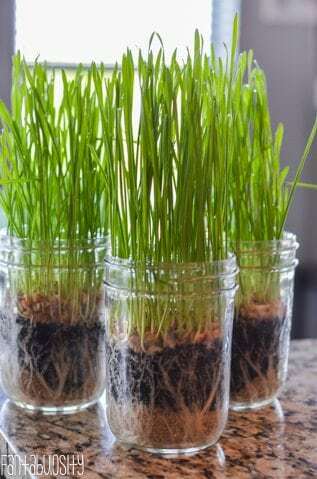 You may already be familiar with wheatgrass shots at your local juice bar, but did you know how easy wheatgrass is to grow in the comfort of your own home? It is simple to grow, cut, and add to smoothies or juices for a daily boost. Wheatgrass is one of the best sources of chlorophyll, contains multiple minerals, vitamins, amino acids, and proteins. With all of these, wheatgrass has the capabilities to help purify the liver, neutralize body toxins, regulate blood sugars, strengthen the immune system, and improve digestion. Since wheatgrass tastes, well, grassy, it’s not ideal for all culinary pursuits. But it is the perfect thing to add to your morning shake or smoothie without much fuss. Simply snip the grass blades and add to your blender. You can also prepare your own wheatgrass shot to give your body an extra boost before you head off to work or school. With herbs such as basil, thyme, mint, chives, and wheatgrass in your kitchen garden, you’ll be more than ready to keep your body and your culinary endeavors in great shape this summer. Start with one or two herbs that sound enjoyable and then you can add to your garden. Experiment by adding some herbs to your favorite recipes or to your morning smoothie. Stay healthy and stay inspired this summer with a home garden! Meet Aamar Khwaja, a foodie with a fiduciary mind. Once a Wall Street banker, now an entrepreneur, single dad, and a passionate believer in the power of home-grown organic food to change your health and the world around you. His own health crisis led him to start a timely project— Modgarden’s tinyFarm. Aamar's perseverance has led to the design of the modular tinyfarming system with a fully automated companion app, allowing anyone to grow their own organic food, no matter how small the space, or how challenged the green-thumb. Family of 7 Living Completely Off-Grid in Northern Canada!